Nihon Kohden’s Cardiofax C electrocardiograph is designed to support the daily routine of ECG diagnostics and offer high-level analysis for a reliable diagnosis. Cardiofax C uses the Nihon Kohden ECG analysis program ECAPS 12C. It provides simultaneous 12-lead ECG acquisition and analysis with approximately 200 findings with active noise suppression. Accurate data supports fast diagnosis. With its 4.8’’ angles display, 12-lead waveforms can be confirmed at a glance before recording. Cardiofax C has a built-in LAN and supports paper based and paperless workflows – waveform and analysis results can be transferred to a PC for review. The lightweight and compact design of Cardiofax C and a long battery operation time support high mobility in the daily workflow. Easy-to-view: Its 4.8’’ tilted display enables viewing of 12-lead ECG real-time waveform and data more easily. The preview function allows for checking 2.8 seconds 12-lead waveforms and analysis results before recording (3 channels). Electronic recording: Up to 40 ECG files can be stored in the internal memory and approximately 3,000 ECG files can be stored in an external SD memory card. Moreover, ECG data can be transferred to a PC using a wired LAN. The ECG data can be reviewed and compared on a PC with Nihon Kohden’s optional ECG data management software polaris.one. 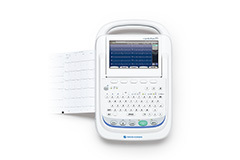 Paperless ECG management saves time as well as money. Enhanced workflow: Supporting barcode or magnetic card reader which saves not only time when entering the patient ID but also reduces potential data entry errors. Highest mobility: Its lightweight and compact design of just 1.7kg and a long battery operation time of more than 120 minutes allow for the highest possible mobility in the daily workflow. High-level 12-lead ECG analysis: Cardiofax C includes Nihon Kohden’s latest interpretation program, the ECAPS 12C analysis program. It provides simultaneous 12-lead ECG acquisition for up to 24 seconds and analysis with approximately 200 findings and 5 judgment categories. ECAPS 12C can also find typical waveforms of Brugada-type ECG. High-performance compliance with IEC 60601-2-25:2011: Cardiofax C complies with IEC standard IEC60601-2-25:2011, which approves high accuracy of signal processing (AC filtering), ECG measurement, and ECG analysis. It helps you with accurate ECG diagnosis.